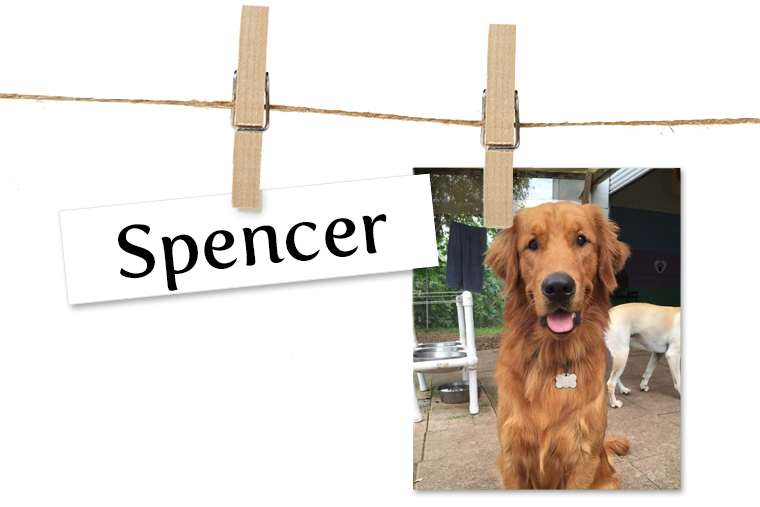 Story Spencer is a 1-year-old Golden Retriever who came into my life at 8 weeks old, 3 months before the love of my life, my 9-year-old Golden Retriever Murphy, passed away the day before he was to come home from a 13 day hospitalization. If it hadn't been for Spencer, I honestly don't know what I would have done. Despite having been a difficult puppy, he's become a beautiful, happy and very loving boy who is pulling me back to something resembling happiness again. I've grown to love him dearly, and he's a wonderful companion, full of life and goofiness. He is the caretaker of the puppies who attend his daycare, herding them away from trouble and pushing in between to separate them if they get too rambunctious. Spencer loves almost everyone he sees, except cats. They make him nervous! Thank you, precious Murphy, for giving Spencer such a good start in life. Thank you, sweet Spencer, for being my Puppy Paws and saving me from myself. Did you like this week's Pet of the Week? Leave a comment below and let us know what you thought!